Greek Revival style features: windows with straight stone lintels and sills, gable roof. Stone water table under first story. Orange bricks are typical Post Civil War Italianate building material. 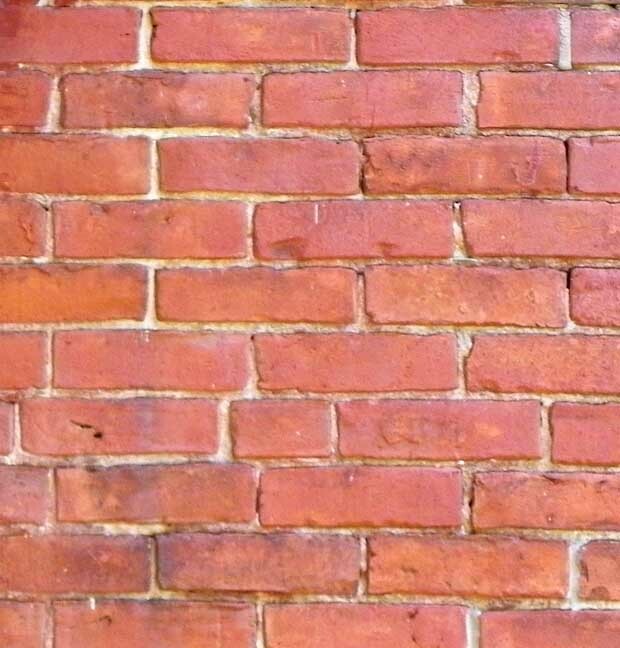 See Bricks for more information. 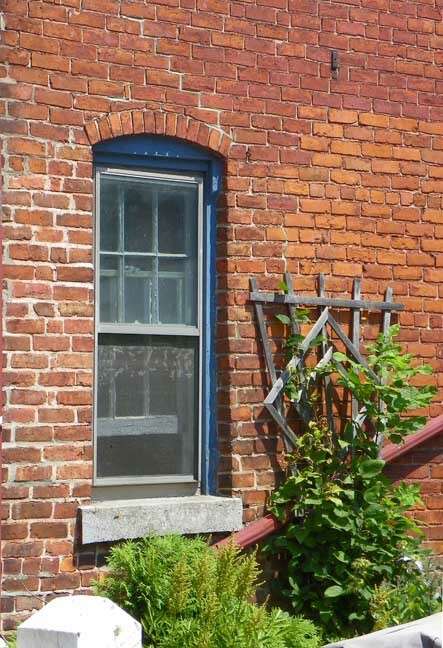 Top window: Italianate with rounded top. 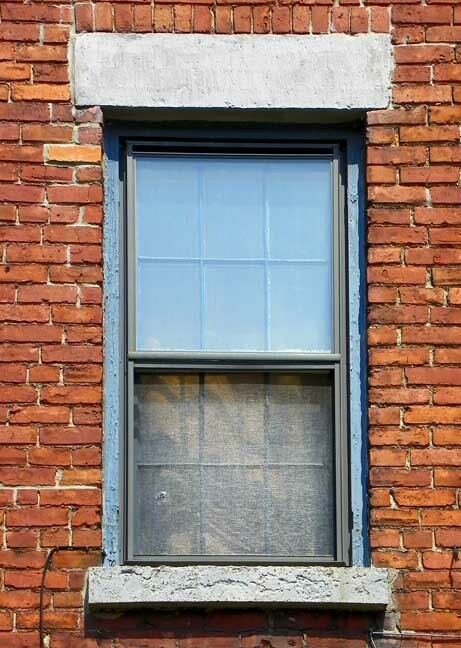 Italianate window with filled in rounded top, a cost saving method of replacing a window. The house was built in three stages. The front segment is the original, then a middle section (two windows deep if you count from the North side) was next. The last section is our kitchen. Thick brick walls that were previously the exterior separate all three additions. You can also tell this from the size of the doorways between each section. This is a little more evident in the brickwork on the South Side too. We have a contractor lined up for this month to paint the wood portions of the house. The side porch in all its decrepitude is coming down. It will be partially rebuilt. The back porch is to be repaired too. The garage was built from old box cars and has a drainage out to the street (an adventure in drainage uncovered that aspect). The house is almost nearly intact in the exterior. All of the original woodwork remains and nothing has been unduly carved up. Our house is zoned as a double, but the only interior evidence is that the main stairway was enclosed upstairs and a kitchen fixtures put into the room at the West end of the house. We run two boilers. The average residential lot in Black Rock is 85-90 feet deep with 30-35 feet frontage. Due to the age of the Dayton House compared to its later turn of the century neighbors, it is uncommonly large, a 47 x 112 deep. The building is constructed of two brick building blocks. The first is the original two and half story c.1840 Greek block, which is topped with a side gabled roof of medium pitch. 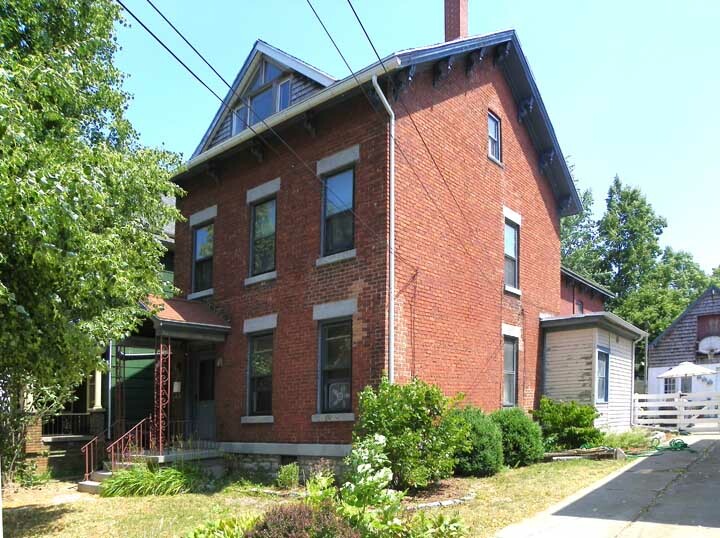 The second is the c.1870 two-story rear kitchen block, which is additionally topped with a low pitched gable and a pediment that faces the rear of the property. This smaller rear addition is offset to the north of the building, creating a discrete L in the building’s overall form. 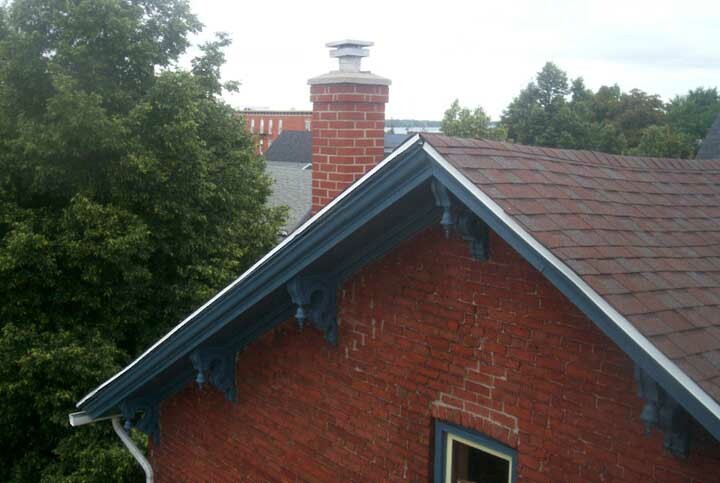 The two blocks are unified by their brick material and decorative brackets introduced during the Italianate building period. 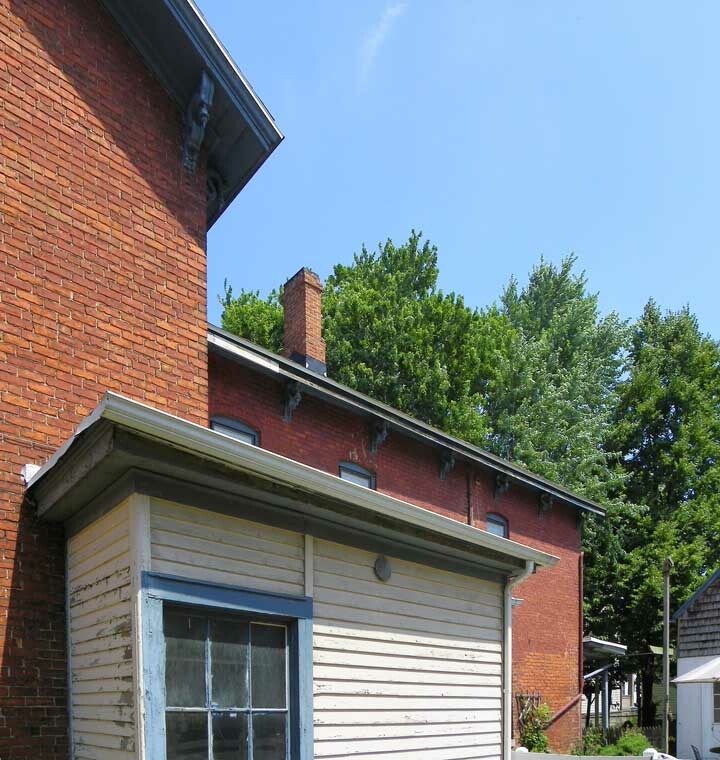 The c.1840 block includes a cellar, with the addition resting on a crawl space. A single story, flat roofed wood porch is located on the southern elevation where the two blocks meet. This is an L shaped porch and was likely introduced at the time of the rear addition; it was probably open, suggested by thin square wood porch supports that match a smaller rear porch. The facade of the Dayton House is organized in strict symmetry at three bays and a side hall entrance to the left. 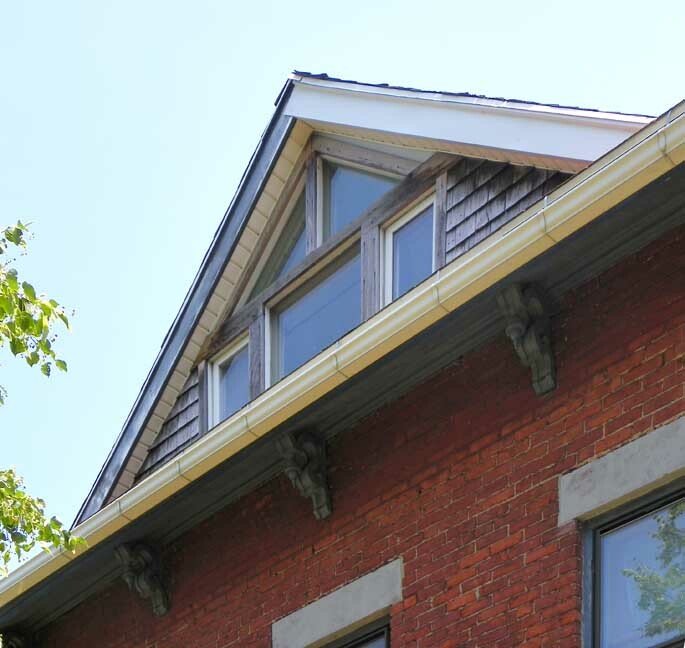 The windows are topped with smooth planed stone lintels and thinner stone sills. A stone water table separates the brick from the stone foundation. Windows on the facade are one over one wood sash and likely early 20th century replacements, as the remainder of the house includes both six over six and four over four sash, more typical of the Greek and Italianate period. 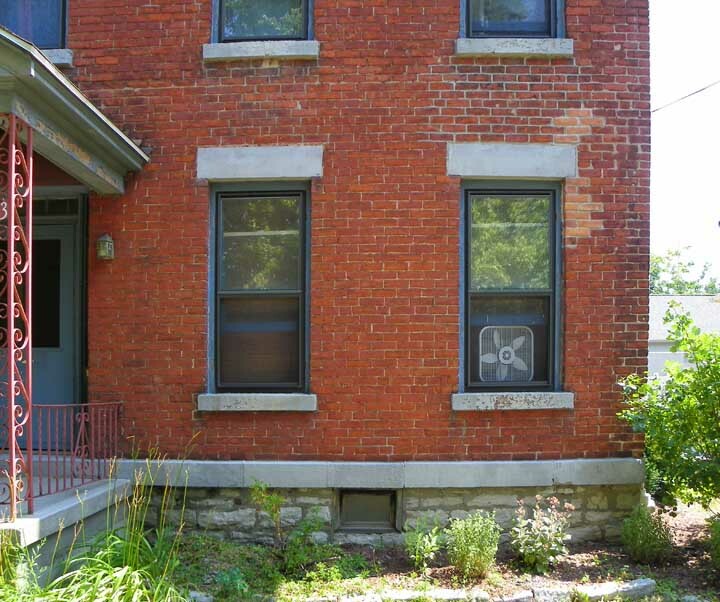 These windows, as are the majority on the house, are covered by non-historic exterior storms. The paneled front door dates to the first building period and is framed by thin sidelights and a side-by-side paned transom. 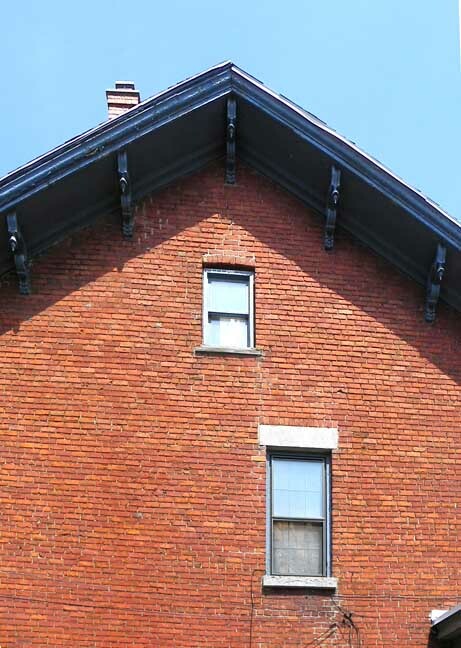 The rear of the building is defined primarily by the Italianate design elements, with the forward facing pediment revealing the brackets more clearly than other areas on the house. This addition is set off to the north of the property and is two bays wide with a roman headed one over one sash window in the peak. Windows on the rear, and on this block in general, deviate from the principal facade, with engaged segmental arches replacing the larger lintels on the earlier block. (Thinner stone stills remain consistent throughout the window program.) On this rear elevation, the windows are six over six sash, with two sited above a full length rear flat roofed porch. The porch is supported by square posts with simple square capitals. Within the porch, a rear entrance to the south provides access to the first floor and a square bumped out portion at the north of the first floor provides access to a rear stairwell, suggesting a possible service use. A six over six sash window is located on the first floor, centered between the entrances. In terms of elevation placement, a second floor six over six sash window placed on the original block also faces this direction, revealed at the center of the house where the two blocks meet. This features the lintel and sill configuration of the Greek block. The southern elevation is fronted by a side yard that has been converted into an asphalt driveway leading to the garage. The stone water table continues on this elevation, up to the transition into the c.1870 addition. Single first and second floor windows on the Greek block are off center to the east and a single double hung window is located in the peak. This window is capped with a segmental arch identical to those found on the addition, which provides evidence that the roof was reconfigured during the c.1870 building reconfiguration. (Further evidence of a roof adjustments was found in the attic, where scorch marks and adjustments in the brick work suggest that this change was the result of fire.) The L shaped porch on this elevation has been filled with clapboard siding, divided glazing, and four over four sash windows. The c.1870 block is three bays wide with six over six wood sash. The northern elevation is fronted by a narrow slate alley, with its neighboring residence in close proximity to the Dayton House. Window patterns on the Greek block are consistent with the southern elevation, with single windows offset to the east and a single double hung in the pediment. The stone water table is absent on the elevation. 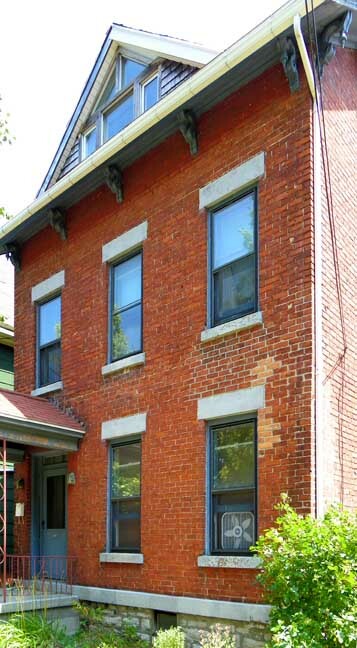 The Italianate block includes two windows on the first floor and one the second, all six over six. The overall form. 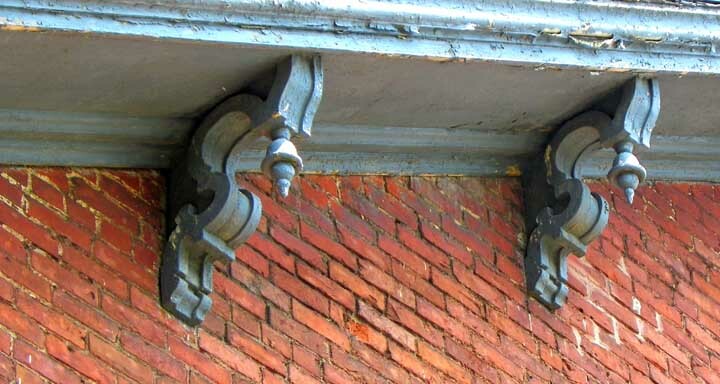 The two blocks are unified by their brick material and decorative brackets introduced during the Italianate building period. 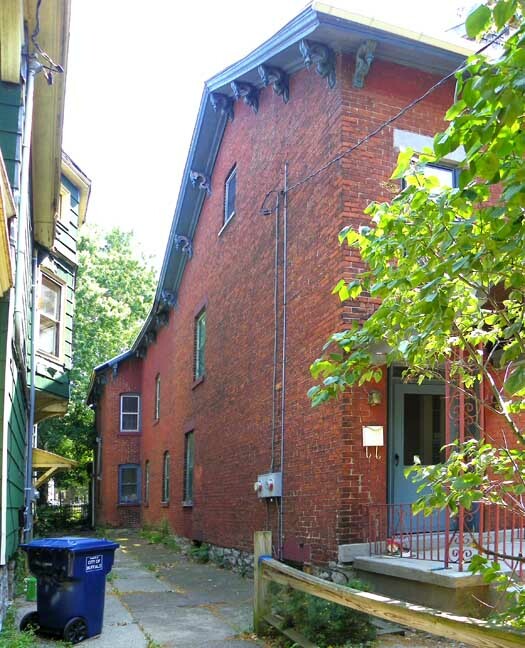 The c.1840 block includes a cellar, with the addition resting on a crawl space. A single story, flat roofed wood porch is located on the southern elevation where the two blocks meet. This is an L shaped porch and was likely introduced at the time of the rear addition; it was probably open, suggested by thin square wood porch supports that match a smaller rear porch.